By Maria Angela “Yanna” Aragon. 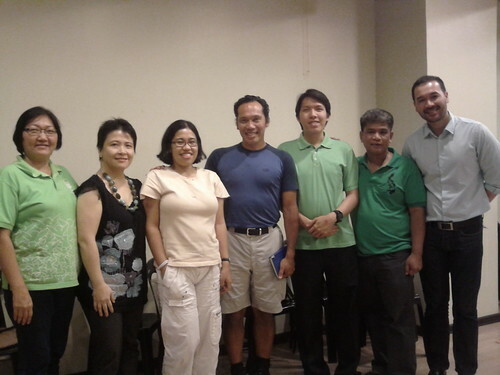 PWA Yanna, the author (third from left), Vicente Rubio (in shorts) and seminar organizers. An SMS was sent to me by Perlita So the day before the back-to-back seminars’ (“Autism, Health, and Well-Being”, and “Autism and Mentoring Life Skills through the Ages”) were to have their first run, asking if I would be interested in attending. My interest was piqued after going through what was written in the attached promotional brochure. After informing Tita Peng of my intent to attend both sessions, and listening and having the chance to talk to Ron Vicente Rubio (the speaker), I was thankful that I received that text message. I had the chance to talk to Mr. Rubio as soon as I entered one of Quality Life Discoveries’ activity rooms, where the seminar was held. While in conversation, I didn’t notice anything that gave away his being diagnosed with Asperger’s Syndrome. Then again, he mentioned the same of me. From what I remember, he was specifically talking about how I carried myself -- perhaps my body language? Once the first session began, and the Powerpoint slides were being flashed on screen, I was surprised to find out that autism incidence -- in the US, at least -- was on the rise. Even more so when the session turned into a mix between an etiquette and a fitness class, as we were taught how to properly sit, stand, and breathe -- not that I complained. On the contrary, I enjoyed being able to move a bit instead of sitting all throughout the session. The second session was more of a summary of the issues plaguing people at certain stages of their lives, supplemented with stories of the speaker’s experiences of mentoring various individuals. I was a bit disappointed that most, if not all, of the information mentioned by the speaker were in the context of the United States. As he had grown up there all his life, it’s understandable though. The most interesting part of the seminars came during the Q&A after the second session—when it turned into a mini-demonstration of how to use some martial arts techniques to subdue and disarm a potential attack. For those wondering how this came about, one of the participants asked how they can subdue students with violent tendencies. However, the most insightful part of the seminar came near the end, when Mr. Rubio made mention about two ways by which children of special needs -- perhaps all individuals, now that I think about it -- are made to relate with the world. One way is to pamper and spoil them, protect them from all that is ugly and painful. The other way is to have them fend for themselves, to deal with that which can hurt them, to seek their own survival. At that point, I was reminded of one of the most important lessons I learned in a philosophy class, back when I was in college. It was a lesson on freedom: that freedom is not found in sheltering one’s self from the world -- limiting the choices one made. Freedom is found in the stepping out into the world, where many more choices can be found. Mr. Rubio also talked about letting individuals decide for themselves, and being accountable for their actions. I then realized: being too overprotective of individuals -- to the point of making decisions for them -- would impair their capability to choose for themselves when they get older. In addition, they might have difficulty moving around in, and contributing to, society. With this, I am reminded of seeds kept inside those packs sold in supermarkets. Though they are in perfect condition, all are useless until they are planted in the real world. On the other hand, exposing a child to the real world entails him getting hurt and having to make decisions for himself from time to time. However, with guidance, all are ways by which the child can mature and be independent—much like the bud that, although exposed to the elements (and with proper care) can grow to become a sturdy and useful plant. I know that teaching special children to breath, sit, and stand properly may seem silly vis-à-vis giving them the capabilities to be independent, but performing these actions will not only promote good posture; but will also allow them to keep calm and to focus, allowing them to tame their ‘chattering monkeys’ and prevent them from having meltdowns. In addition, having them focus will allow them to be able to make clearer decisions. Combine this with being able to advise and challenge them to live out important life lessons, without spoon feeding; and they will be one step closer to living independent and fulfilling lives.